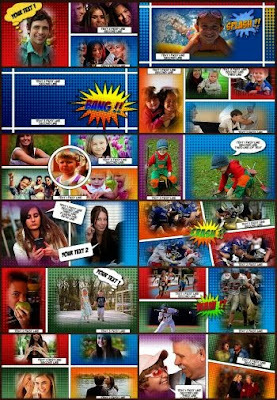 The effects included in this template try to recreate the atmosphere of comics books, with their specific artwork: vivid colors, speech bubbles and moiré patterns. The template includes 20 slides, that can be all customized, in Producer. You may include as many captions and speech bubbles as you wish, and place them wherever you like on the page. All the captions for the sound-effects bubbles can be edited in Producer, and you can create new ones if you wish, in any colors that you like. Also included in the template are four Turn Page transitions (that can be viewed separately here). The other transitions used in the template are all built-in ones, that come with the program. The zip file that you receive includes all the graphic files that you need for this template, the 4 Page Transitions, the template show/s, and tutorial. Just bought your comic book set. Very well done. I don't buy a lot of 3rd party styles but this one caught my eye for it's bright colors and unique style. I know I'll make good use of it. Thank you, Joe. I'm glad that you like it.